The candy-coloured, fantastical architecture of Pyongyang, capital of one of the planet's most secretive countries - North Korea. The candy-coloured, fantastical architecture of Pyongyang, capital of one of the planet's most secretive countries - North Korea. Places visited and photographed by the Guardian's architecture critic and journalist Oliver Wainwright and published in the book Inside North Korea. Here in the northern hemisphere, we're in the middle of summer - time for holidays and travel, or at least time to spend reading, maybe even books about distant lands. North Korea is one of those countries that gets us all fired up just due to the fact that it is the Hermit Kingdom and also because for months it has dominated the global geopolitical debate, culminating in the momentous recent summit in Singapore when Donald Trump and Kim Jong-un met face-to-face. Two world leaders with rather particular tastes when it comes to architecture, as described by Oliver Wainwright, the Guardian's architecture and design critic and photographer, as well the author of the book “Inside North Korea” just published by Taschen. But while Trump's extravagant tastes are generally well known, Kim Jong-un’s taste and his father's architectural legacy are a more closely guarded secret. 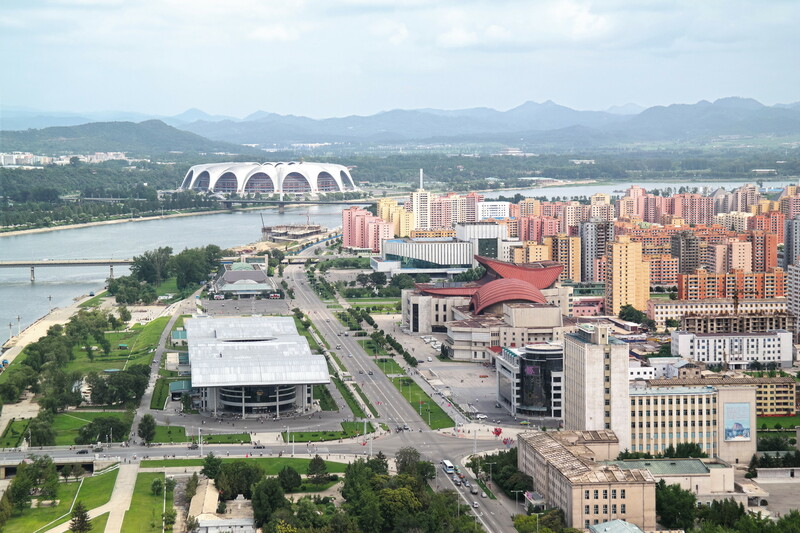 A trip to Pyongyang is highly unlikely for us, so if we want to see how the skyline of the North Korean capital is changing through new, towering constructions, our best bet is to follow in the footsteps of Oliver Wainwright, who takes us on an architectural journey behind closed doors in the world’s most secretive country. His photographs of the most recent architectural projects show us the reclusive regime's ambition to “turn the whole country into a socialist fairyland”. Because, unlike what we might expect from a nation where austerity is the order of the day, “Pyongyang (is revealed) to be a place of candy-coloured apartment buildings and pastel-hued interiors - a series of precisely composed stage sets that could be straight out of a Wes Anderson movie”, in the words of Wainwright. Indeed, the photographs taken in the capital don't show us the drab Soviet-style world of crumbling concrete slabs and inflated Stalinist ministry buildings. Pyongyang instead unfolds as a pastel panorama with blocks in minty green and terracotta, mustard and ochre. The more recent apartment towers look like sticks of seaside rock, clad with spiralling blue balconies. A riot of colours that continues inside, where it was already in use in the mosaic-lined lobbies of Soviet-era health centres and the sugary-coloured interiors of more recent constructions. The architects in North Korea continue to “make tireless efforts to create architecture amenable to his people”, as Kim Jong-il, father of the present leader, declared in his 1991 treatise on architecture based on the Juche ideology, specifying that all architectural inspiration should be uniquely Korean. The Wes Anderson-style colourful opulence is, of course, only found in the capital. The rest of North Korea is far removed from this architectural makeover, still reflecting the stereotypes we normally associate with this country. Still, we'll be enjoying Oliver Wainwright's book during the holidays. A story full of colours to explain a changing nation through its state-ordered “architectural anaesthetic” that lulls people into thinking all is well.